AIR 1000 by ECOTECH is a specialised plant instrument air cleanup system. It is designed to remove contaminants such as SO2, NOx, CO, oils and particulates from plant instrument air and lower its dew point to less than –15 ºC. The resultant ‘zero air’ can then be used in the ECOTECH CEMS or for instrument calibration. The air clean up system’s scrubber material and filters can be replaced quickly and easily by hand without tools. Chemical scrubbers are used to remove SO2, NOx, H2S and CO2 (dependent on application). HCS1000 Heated Scrubber used to remove CO (optional). HTO1000HC Heated Scrubber used to remove Hydrocarbons and CO (optional). Deltech 810 Series Filter provides efficient multistage filtration which removes dirt, oil and water without the need for a pre-filter. Each layer removes progressively smaller particles, mist and droplets. 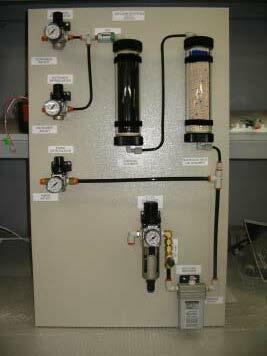 Includes powder coated metal panel (wall mount) with shutoff valve, Deltech mist separator, filter, coalescing regulator with gauge, safety relief valve, molecular sieve 5A scrubber, charcoal scrubber and DFU filter.